Note: Workshop instructors are listed alphabetically by state. You must contact the instructor directly for workshop availability and to register. It is the responsibility of each instructor to respond to queries and maintain updated contact information and scheduling. The Weaving Kind does not guarantee workshop availability. Beginning, refresher and specialty weaving classes offered in our historic Eureka Springs studio/shop. Learn the basics of artful tapestry weaving, including setting up your loom and essential techniques to start you on a deep weaving journey. Janelle teaches Introduction to Frame Loom weaving classes with a focus on inspiration and materials. In addition to providing weaving instruction locally in Los Angeles, Janelle will be teaching at the 2017 Weaving Kind Makerie. Learn rigid-heddle weaving over the course of four classes in Rachel's intimate Little Italy studio space. In an intimate class setting, you will learn how to warp your loom, the basic stitches of woven tapestry, and finishing techniques; we will also explore how to incorporate alternative materials such as denim, leather, or found natural materials to create diverse textures in your tapestry. Kumihimo, Lucet, and Hand Loom workshops, summer camp, and retreats for children and adults which include creating looms from wood and weaving with plant-dyed wool yarns. Sarah teaches public and private weaving workshops including Weaving 101, Weaving 201, and Weaving as Meditation, with an emphasis on weaving as a healing practice. Beginning and Advanced Weaving for Adults / Beginning Weaving for youth 7-12 and youth 13-18. I offer Beginning Weaving Workshops (loom and all materials included), Textural Roving Workshops, Teen and Kids Weaving Workshops, Indigo Dyeing and private fiber-based events in Chicago. Inspired by the old sewing circles and expanding on the theme of intimate, creative social gatherings, I curate craft events at some of Chicago's most beloved bars, restaurants, coffee houses, boutiques, and breweries. I love utilizing classic, traditional art/craft processes such as weaving, embroidery, printmaking, and watercolor, and putting a contemporary spin on them to bring you a unique learning experience. Learn the basics of weaving, complete your own woven wall hanging, and take the tools and skills with you to keep on making at home with Jess of Whisker Row. Clare offers modern tapestry weaving workshops that emphasize the learner's personal vocabulary of imagery, shape, and color. I offer classes catered to beginner and intermediate weavers who want to learn in an experimental and conceptual environment, using fiber and natural dyes to create contemporary textiles. WE GATHER offers beginner and intermediate weaving classes with a focus on the rigid heddle loom, as well as dyeing classes for those who want to learn how to add color to their lives. 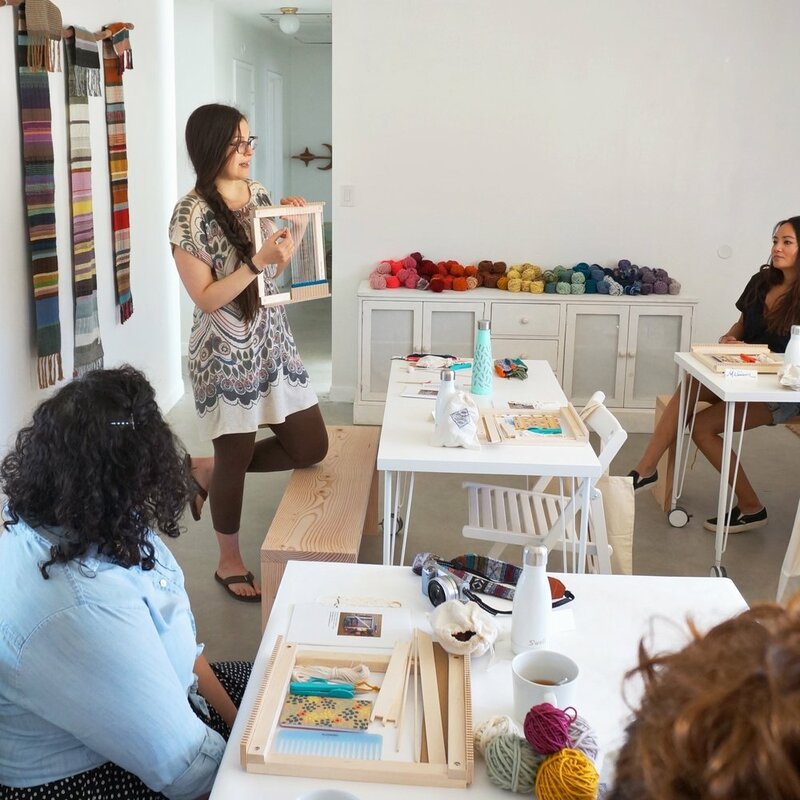 Beginner tapestry weaving workshops in a relaxed + inspired setting with an emphasis on color, experimentation and play; all are welcome from fiber newbies to crafty pros! @hellopidgepidge on instagram. Gabi teaches Introduction to Weaving Workshops where you will learn all the basics from warping the loom to finishing off the weaving and hanging it on the dowel. You'll learn everything you need to know to create a unique woven wall hanging. 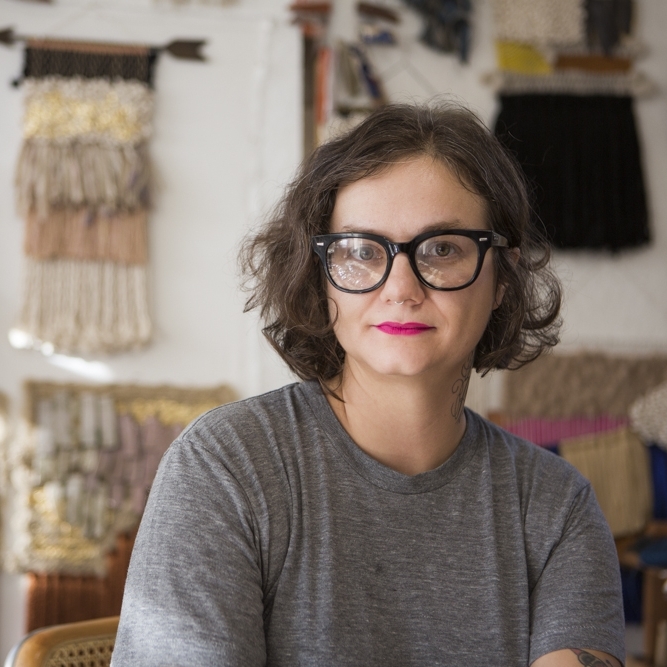 Alicia Scardetta offers tapestry weaving workshops where you can learn the basics of weaving on a frame loom and explore color, pattern, and texture! I teach creative and fun beginner weaving workshops in my bright Brooklyn Heights jewelry boutique. I’m passionate about sharing knowledge with others, I teach a series of beginning weaving classes and I coordinate the programming at the Yadkin Valley Fiber Room in Yadkinville, NC and travel to other venues to foster learning and creativity in the fiber world. Based in Columbus, OH, Sarah offers beginner and intermediate level weaving classes throughout the Midwest, including cities like Cleveland, Cincinnati, and Pittsburgh; all students learn to weave on her handmade wooden frame looms. Registered SAORI weaving studio and instructor offering instruction in SAORI Japanese freestyle weaving. Learn everything you need, from start to finish, to begin making one-of-a-kind woven wall hangings! Offering beginner and intermediate level weaving workshops. Each student takes home their own hand loom and tools, weaving patterns, instruction booklet and lots of knowledge to send them on their new weaving journey! I offer tapestry wall hanging weaving workshops as well as two-day intermediate weaving workshops in my light-filled private art studio in the trees, often featuring local ethically sourced wools and other unusual up-cycled materials. Offering beginner & intermediate weaving workshops, pop-ups, private lessons, & party packages throughout the Midwest, including additional topics such as woven jewelry, ornaments, and more!